The 585 actually measures 5.87m length on deck – excluding the bowsprit – and the external beam is 2.14m. A welded hand rail at the bow makes the boat easy to move around and the aluminium hatch in the 585 cabin top provides access to ground tackle – or a comfortable standing position for an angler. The 6mm thick toughened glass wind screen is mounted in a solid fabricated aluminium surround that doubles as a handhold. The windscreen deflects the air away from the helmsman and the windscreen surround flares out to make a spray break at the aft end. A set of acrylic clears (which take about six minutes to fit) put paid to any wind chill factor. Made by East Coast Canvas, the clears fit into aluminium channels at the front and, like the bimini top, they are tight and flap free. Standard LED navigation lights are mounted on the dodger and there’s a plate welded to the rocket launcher to mount a masthead light. All round visibility is excellent; either standing or sitting in the moulded plastic swiveling seats. The Yamaha controls and Teleflex steering wheel all fall close to hand and welded, aluminium rail footrests are located right where they should be. The cabin is lined with black Frontrunner carpet, and has plenty of room for stowage. There is also good access to the back of the dashboard for fitting extra electronics or if wiring repairs are ever needed. Having no bulkheads gives it an open, airy feel and I could envisage owners throwing a foam mattress in there for an afternoon nap. The Profile’s internal beam is 1.65m and the wide gunwale on top of the pontoons provides comfortable perching for up to six adults. 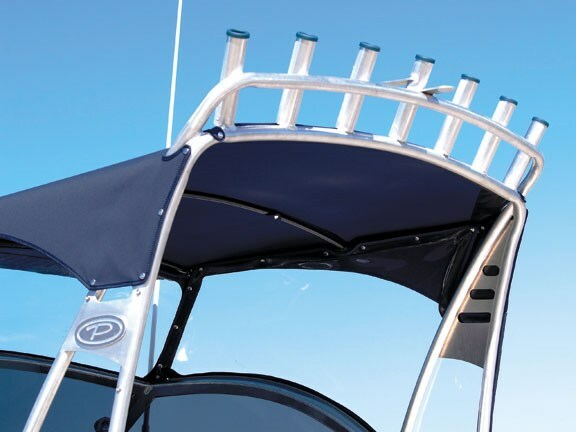 Two rod holders are set into either side and seven more are mounted on the rocket launcher above the bimini. An under-floor bin in the cockpit can be flooded, and could also be used to carry four or five dive bottles. Full length bins on either side of the cockpit could also be utilised. All the engine controls, electronics and wiring looms are hidden in an aluminium channel on the starboard side of the cockpit, with a removable cover. 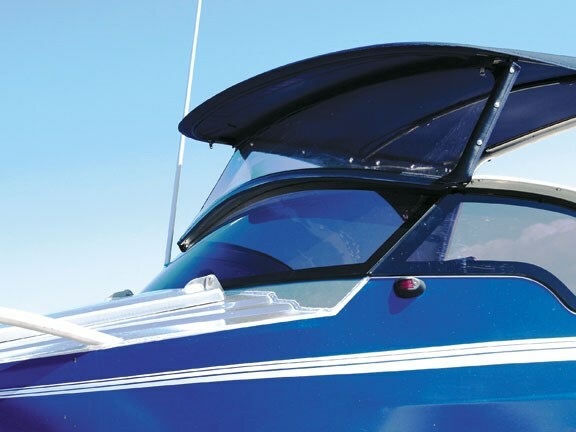 The deep sides give a sense of security in the boat, and for the extra cautious, there is also a 633mm transom height option. A Rule electric pump in a bilge sump aft takes care of any water that slops aboard. The 585 uses 5mm thick marine grade aluminium bottom plating with full length stringers, and the pontoons are 3mm. It’s all covered by a three-year structural warranty. 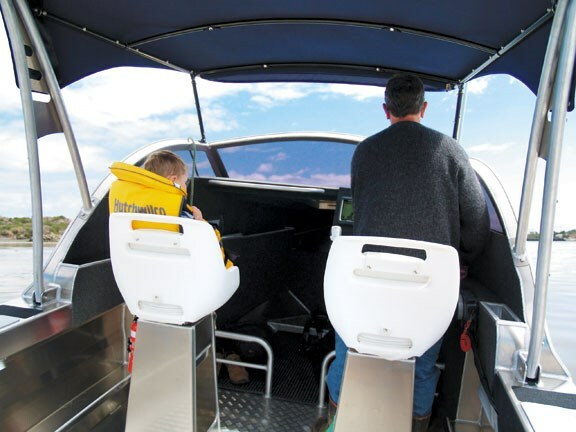 The sense of security is enhanced by the fully-welded 4mm thick aluminium tread plate cockpit floor and the liberal use of grab handles on the bimini frame, transom and sides. Firmans recommends 100-130hp for the 585 and the 115hp Saltwater Series Yamaha looks good on the boat’s portofino platform. It’s bolted to a central watertight pod with a watertight inspection hatch. 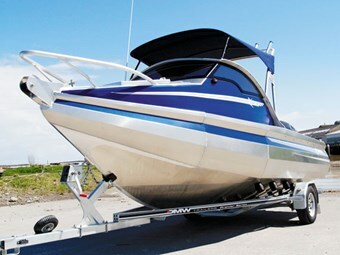 The Yamaha draws its fuel from a 100 litre-under-floor aluminium tank, mounted independently of the hull and deck. Start battery and engine oil tank are also housed in behind watertight hatches in the transom. There’s a single step fold down boarding ladder at the business end of the boat and a removable nylon bait board. A little bit of rocker is built into the Profile hulls, which gives good underwater buoyancy in the ends and reduces any tendency to hobby horse. The shape also adds strength and reduces the pounding often inherent in large, flat underwater sections. The 585’s 17o deadrise at the transom gives good seakeeping ability without sacrificing too much hull volume aft. 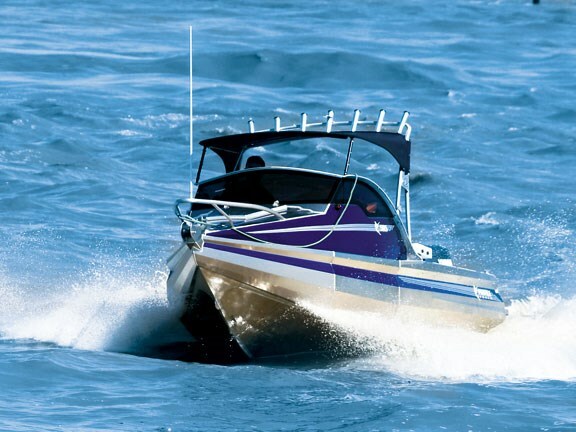 In one-metre swell, the boat feels secure and controllable. 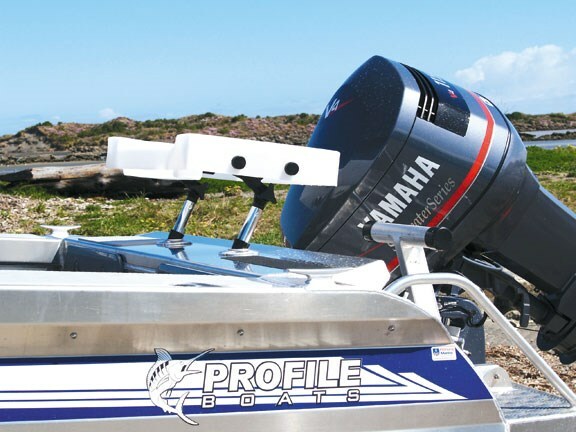 The Yamaha’s 115 horses loaf along at about 3600rpm, which provides about 28kmh (15 knots) of boat speed and the Profile casually flicks from lock to lock to avoid flotsam without any fuss or indications of propeller break out. Heading upriver we flattened the throttle to 5200rpm and the Yamaha instruments indicated 42kmh (23 knots). The 730kg Profile has an easy presence in the water. 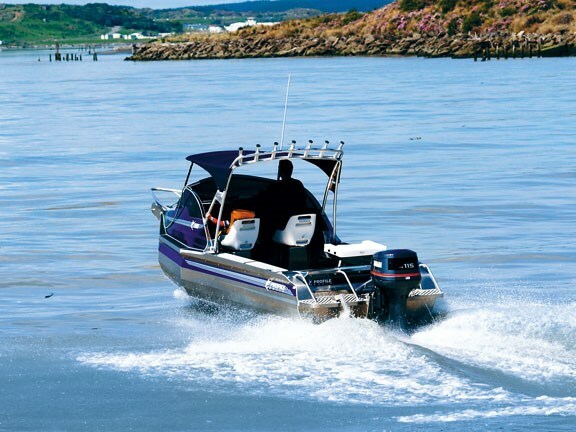 The Yamaha has to work hard for a second or two to break it out of the hole but, once it’s up and running, the boat maintains good speed at reduced revs and is easy to throw about without any tendency to break out or skip sideways. In a tight turn the Profile 585 just sticks its shoulder into the water and gets on with the job, remaining level and controllable. It is also vice free and controllable coming out of the turns and the steering feels positive at all times. Overall, the 585’s an easy boat to climb behind the wheel for the first time and feel confident in. To read in-depth boat reviews, see the latest issue of Trade-A-Boat magazine, on sale now.